The idea of a gaming router is mostly nonsense. When you break it down, there’s very little which makes a gaming router distinctly useful for gaming. For the most part, gaming routers really just take features that already exist on regular routers, and make them a little simpler to access. Or at least, that’s the general idea. But gaming routers are also consistently ranked among the most powerful and impressive networking equipment on the market. Because the hardware itself is often designed to a higher standard. For most people, the difference between 50ms and 120ms means essentially nothing. But for gamers, a difference like that can mean the world. As a brand, ASUS hardly needs an introduction. They’re one of the most respected manufacturers in the PC industry, from monitors to motherboards. 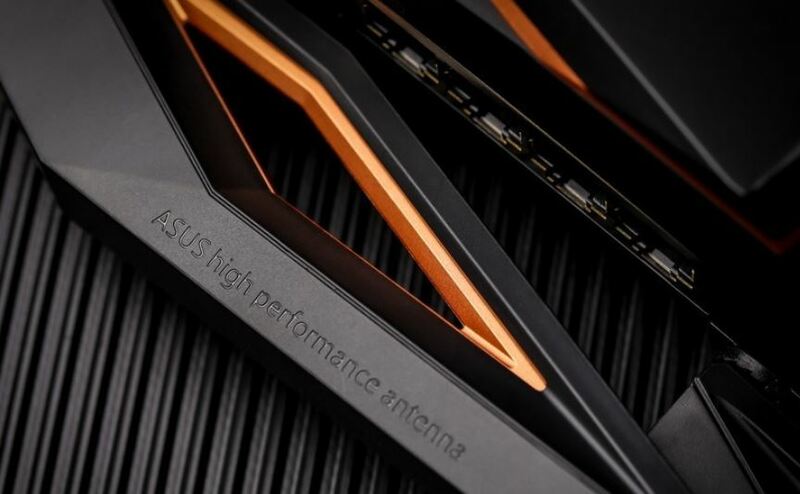 The ROG Rapture GT-AX11000 WiFi Gaming Router can tell you almost everything you need to know about it by reading its name. It’s a router with enormous bandwidth capacity, with an advanced Wi-Fi architecture, and with an emphasis on gaming features. Some people like the idea of hiding away their router where it can’t be seen. 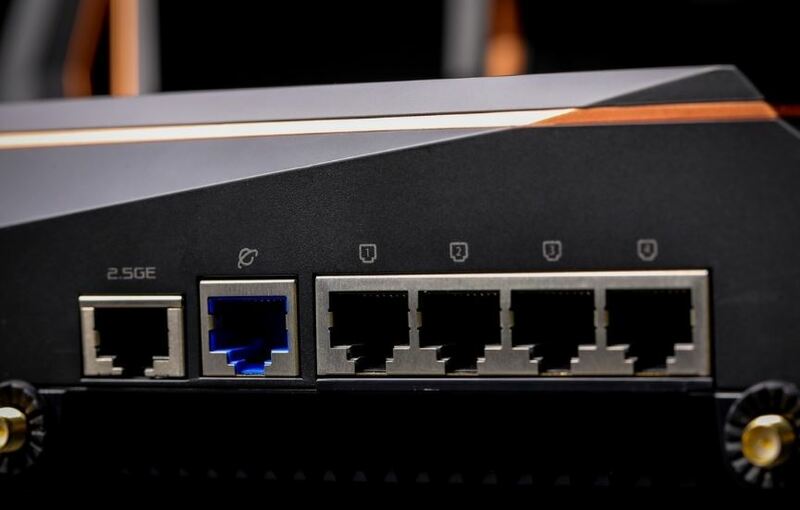 But if you’re serious about getting strong wireless connectivity, then you want your router to be positioned appropriately to help spread your network. That generally means having your equipment in a conspicuous position. To that end, the aesthetic of the ROG GT-AX11000 Gaming Router is actually worth thinking about. With respect to network performance, the GT-AX11000 is almost unparalleled. When you start to put this equipment to serious industrious use, like a LAN party among 25 friends, you’re going to encounter some issues. But it’s really only circumstances like that, which are outside of home-office environments, where the GT-AX11000’s performance will fail to deliver. The Rapture AX11000 measures roughly 11.3 x 4.7 x 14.9-inches. Standing almost a foot tall, you’ll notice the height is almost entirely the result of the eight antennas. Equipment with this many antennas looks stylistically attractive, but it also ends up consuming a lot of space. Size is actually one of the bigger weaknesses of this router. The equipment is large, and you won’t find and wall-mounting capabilities either. You’d have a slightly difficult time mounting it, anyway. Antennas aside, this beast weighs about four pounds. That’s two or three times the weight of many home office routers, so it’s ready to defy simply adhesive mounting solutions. Because this is a gaming router, and there are about a million different opportunities to use LEDs on the antennas, ASUS was kind enough to provide some LEDs. They’re mostly positioned along the topside of the device, in a square-like formation, but the ASUS logo lights-up as well. 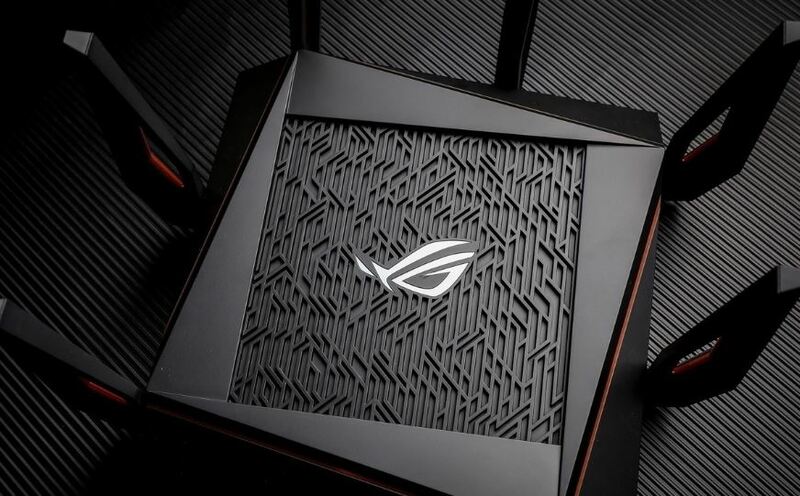 The top face of the router has a cool stylized mesh lattice design, highlighted by the ROG logo. Since the ROG GT-AX11000 is an ASUS product, it supports their Aura RGB lighting software. Even if this was your only piece of Aura gear, you can still fully customize the appearance and display patterns of the LEDs. You can get all your different Aura get to visually sync together through the Aura sync app, which can look very cool when you have several different pieces of equipment working together. For people who don’t really care about LEDs, it’s also possible to switch them off. 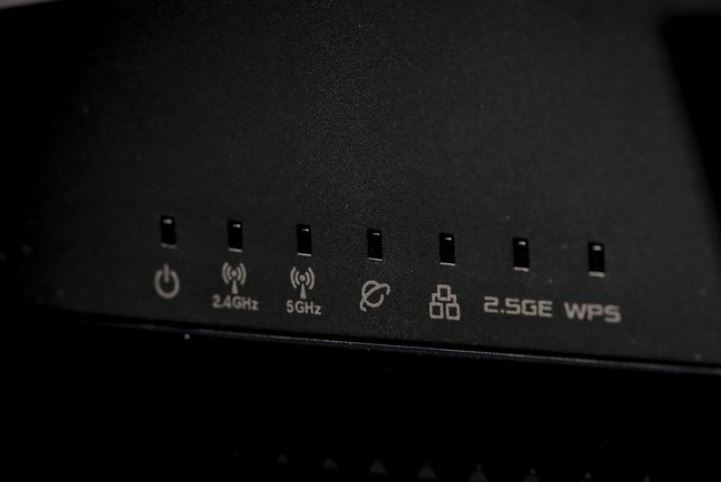 On the backside of this router, you’ll find a pair of UBS ports. Both ports are stacked closely together. 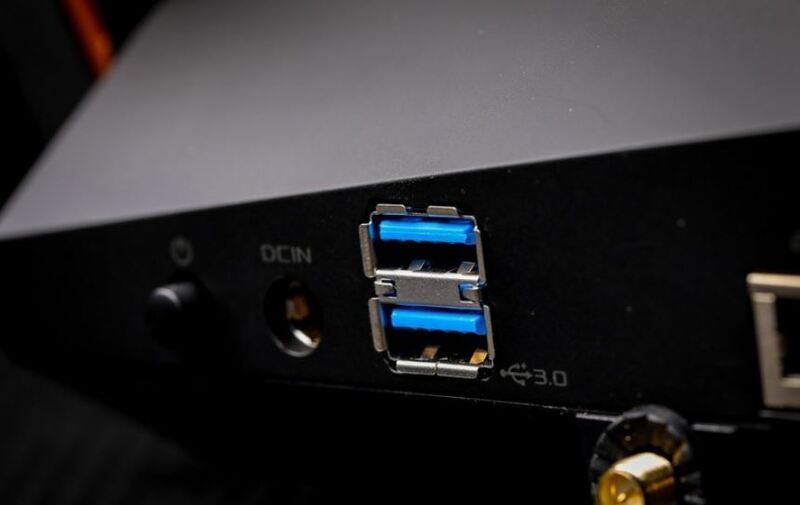 The position of the USB ports is a minor problem because USB Type-A connectors often have bulky connection heads. That’s especially true for connections to printers. But provided you can actually connect your cables, each USB port can provide more than 100 MB/s of read speed. This device provides four Gigabit LAN ports, but that’s low-average compared to similar equipment in this price range. Apart from those ports, you’ll also find a power button, reset button, DC power jack, a WAN port, a 2.5 Gbps LAN port, and dedicated RJ45 port for gaming. 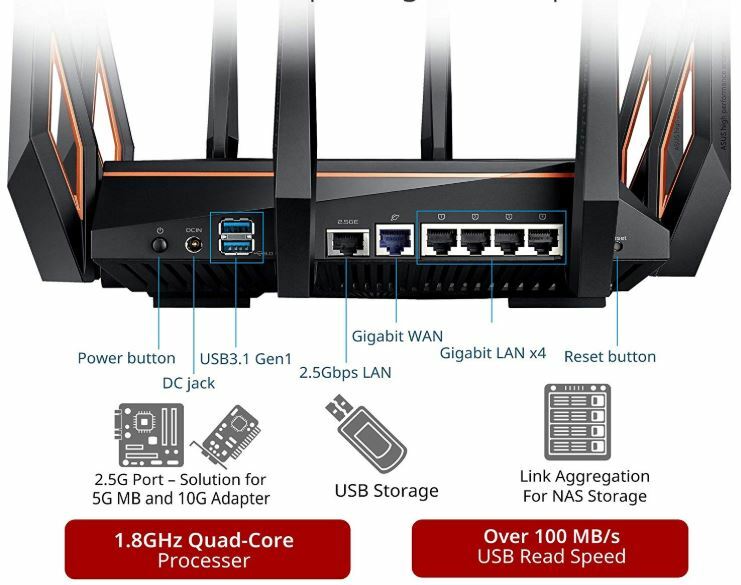 The GT-AX11000 Tri-Band Gaming Router makes use of the 802.11ax architecture, also known as Wi-Fi 6. Like you may have guessed, this format was made to help fix the shortcomings of the previous version. Compared to the output of an AC or N router, the difference is insane. The maximum throughput of 802.11ax is something close to 11 Gigabits of information. It’s also more than twice as fast for multi-device setups, and it has a maximum Wi-Fi radius that’s nearly twice the distance of Wi-Fi 5. That kind of improvement in coverage can lead to incredible gains in the battery lifespans of your mobile devices. Because if your smartphone has to struggle less to find a steady signal, that’s only going to help you. Though in order to benefit from the features of 802.11ax, you’ll need your Wi-Fi client to be capable of taking advantage of those technologies. 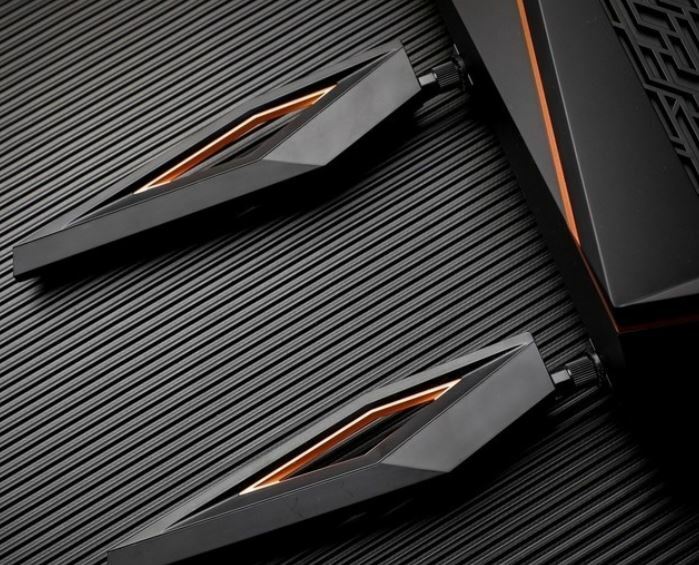 The ASUS ROG GT Rapture AX-11000 is just as impressive from a hardware perspective. That’s because it’s built around a 1.8 GHz 64-bit quad core processor, comparable to the kind of processor you’d see inside an impressive gaming PC about a decade ago. And it’s important to have that kind of power for handling many of the other technologies associated with this router. For example, MU-MIMO support also allows you to use orthogonal frequency division access (OFDA.) Being able to accommodate communication with several different devices simultaneously can chew through processing power. That’s where the quad core comes in handy. Having that kind of power means you won’t encounter any kind of bottlenecks in performance. MU-MIMO is rarely touted as a gaming feature, but it can have some ancillary benefits to gamers, especially for mobile gaming. When your network has numerous devices connected, even if they’re not drawing large quantities of bandwidth, their connectivity can create network congestion. This kind of congestion typically affects gamers more than any other group of people because it can have a direct impact on latency. MU-MIMO helps prevent those kinds of problems from cropping up. Additionally, the tri-band design features one 5 GHz dedicated band, made specifically for gaming. Though if you want to take advantage of that band, then you’ll need your device to have line of sight with the router. The tri-band network gives you 15 channels among the 5 GHz band. As a result, you’re not going to encounter networking problems even in areas with Wi-Fi traffic congestion in the air. But once again, placement of the router is essential to determining how much you’ll be able to take advantage of those benefits. When it comes to actual gaming features, as mentioned earlier, it’s mostly about making things easier. 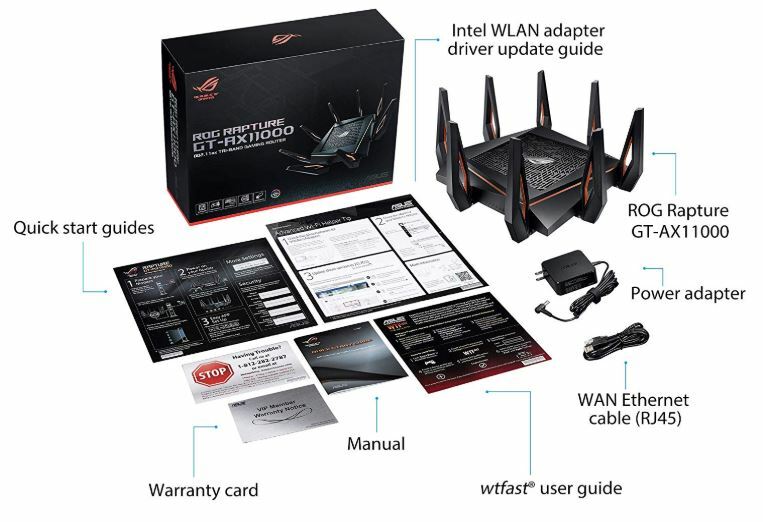 For example, the ASUS ROG GT-AX11000 Tri-Band WiFi Gaming Router can help you do port forwarding in three easy steps. You just select the game you want to play, press the activation button, and you’re done. Of course, other routers will allow you to do port forwarding. The only difference is the number and complexity of the steps involved. Similarly, the Rapture GT-AX11000 offers game acceleration features to prioritize traffic for your games. This can be switched over to prioritizing traffic for others tasks as well. For example, you might use it to ensure your streaming videos never encounter sudden buffering. Even on a gaming router, you’ll find plenty of parental controls. Outside of gaming, these controls are actually pretty useful for helping keep yourself on task. For example, imagine you found yourself spending too much time on social media in the middle of the day. It would be possible to limit your access to 30 minutes per day. You can schedule blocked time, or manage accounts through adaptive content filters. You can also monitor the health and access of your network through a network activity dashboard. AiProtection provides an additional layer of security on top of the usual protections a router provides. Consequently, you get essential protection against external attacks on your network, including protections for the mobile devices which are connected. You can take advantage of advanced features which are typically reserved for business-grade equipment, too. For example, ROG lets you use VPN Fusion tech. That lets you operate a VPN and a regular web connection at the same time! 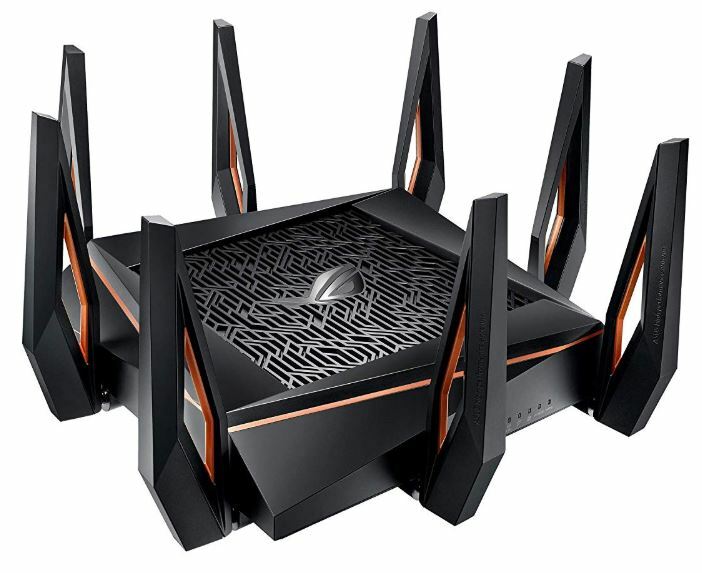 This equipment supports ASUS AiMesh, which lets you use several ASUS routers to create a Wi-Fi mesh in your home. Though this is not technically itself a mesh router, it can be paired with other ASUS equipment and used as a mesh router. In fact, much about this router is customizable. Even the button on the front side of the GT-AX11000 is customizable to perform any function you wish. If there’s one flaw with this router, it’s that the process of connecting an external drive to run as a read/write drive for your network is needlessly confusing. Having any aspect of a router being confusing is really unnecessary these days. But once you’ve got it setup, it’s no longer an issue. Though this doesn’t matter much, ASUS routers happen to be an award-winning and exceptionally popular choice for gamers. What matters a little more is they have industry-leading warranties, and customer service that doesn’t make you want to pull your hair out. Who Should Choose ASUS ROG Rapture GT-AX11000 Tri-Band Gaming Router? If you’re looking for downsides, the biggest negative aspect of this router is the cost. Premium equipment comes with a premium price tag, unfortunately. This kind of equipment would be suitable for eight high-bandwidth wireless connections, and half as many wired connections. It’s hard to imagine many circumstances where that kind of power would be insufficient, unless you’ve got a hundred people on your network. Suffice to say, the gaming-oriented features make it a little easier to keep your connection smooth. That makes this router great for playing essentially any of the most popular games out there. Whether you’re into League, Diablo, or whatever game happens to be trending on Twitch this week. Because the ASUS ROG Rapture GT-AX11000 is incredibly powerful. 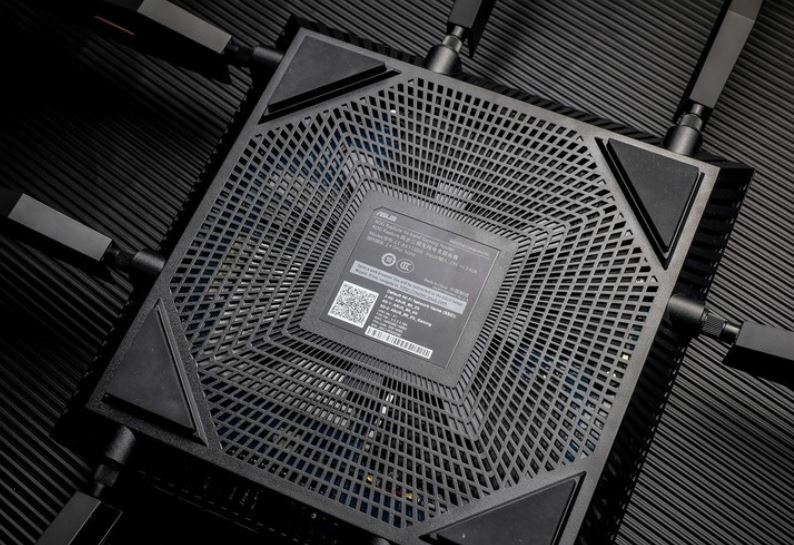 Like many powerful gaming PCs, not many people truly need this level of performance. But if nothing else, this kind of equipment does help ensure you probably won’t need another router for the next decade.